My name is Luukia Morin. I have been a doula for over 8 years. I am a mother and wife who is passionate about supporting families and their choices. The story of my birth shaped the person I am today. My mother was surrounded by family and friends in the comfort of our home. My father a doctor and mother a nurse instilled in me a fiercely confident attitude about the natural birth process. My mothers experience and the stories we share about the birth inspired me to help others create their own memories while providing support during the beautiful transformative journey into parenthood. After the birth of Leela my first child six years ago there was no doubt that I would follow this passion for bringing new life into the world. My husband Peter and I now have two girls that keep us busy and amazed. We love reading together and seeking new challenges to our imaginations. Our family lives a healthy and green lifestyle, eating whole foods and staying active. We're happy wherever we are as long as we're together! Yoga, another passion, goes hand in hand with my role as your doula. I was trained through Yama therapeutics. Working with specialized groups including the elderly and Multiple Sclerosis community has strengthened my awareness of each person’s need. Focusing on the individual allows me to guide your labor using your breath to connect mind and body. As a doula I am guided by your needs. 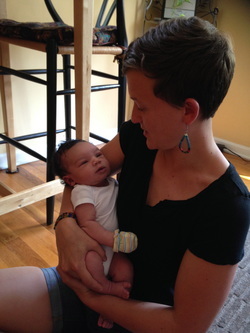 Hiring a doula is your stepping stone toward a partnership nurturing your choices. A doula helps you explore all the options available to you by providing information and resources during one of the most important times in your life. Please take a moment to explore my website and discover the resources that are available to you and your family. Recently I have joined an amazing group of Doulas. This has greatly expanded my community and ensured the best possible support for my clients. Please check out our website at: http://informedbirthchoices.org/ and contact Danielle Koonz for additional information. It will always be a huge honor for me to be part of this intimate moment in your family’s life. Thank you for taking the time to find out a bit about me, now I can't wait to hear from you!